A sneak peek at the in-progress Tarot de St. Croix, and the artist’s journey to the creative process. My tarot journey began when I was a child. 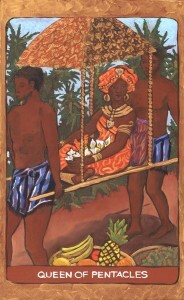 My mother visited a Portuguese tarot reader in Johannesburg who told her that within a year she would be divorced, marry a foreigner, move away from South Africa, live by the sea in a distant land and that her youngest child would become famous. Well, indeed all these things occurred, though I am still working on that last prophecy. My mother bought a Marseilles deck at that time and I remember being awed by the power of the images. 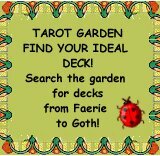 About ten years ago I began to study the tarot. I remembered the old Marseilles deck which my mother had given me and I so carelessly lent to an art school friend and had lost. Speaking to a mutual friend I talked about the deck and she gasped. Just that week she had been helping our friend move and had come across the very same deck. Within a few weeks the deck came back to me. I began to use it to communicate with my deceased mother and I was startled at how it spoke to me in the same way she would. A couple of years ago I did a shamanic journey on the Winter Solstice, in which I traveled to the upper world to meet my spirit guide Isis. She told me to paint the tarot. Shortly after that I began working on the Tarot de St. Croix. The creative process for each card begins when I shuffle the cards and pull one at random to paint. Every time the card speaks to me directly about my current situation, synchronicities happen frequently and I receive many profound lessons. I have entered the archetypal world and am experiencing both the personal and universal meaning of each card. I feel guided by a higher power and have learnt to trust the images that come to me even when I don’t fully understand them. At times I use my personal life, relationships and experiences as imagery but I also use other sources. Sometimes I “journey” for a vision using the classic shamanic technique of the heart beat drum. I also use current affairs such as the Occupy protestors in my Five of Wands. I use my art school training in the old masters technique of layering oil glazes over a Venetian red background. This gives a vibrant luminosity to the colors. I use Renaissance gold on the border which gives a sumptuous rich texture. My intention in creating this deck is to bring new levels of meaning to the classic Minor and Major Arcana of the Tarot. I want each card to first evoke a feeling in the viewer – a gestalt. A closer look then reveals many layers of symbols and their meanings. The World is the final card of the archetypal journey of the soul. This card represents wholeness and as Jung said “…indissoluble communion with the world at large.” The self becomes numinous containing all the elements, all creation and the entire cosmos. In painting The World I was inspired by the alchemical engravings of Anima Mundi – the Soul of the World. They saw the world as a loving, spiritual being. In The World card Anima Mundi is surrounded by the constellations of Leo, Aquila and Taurus. The angel represents the great mystery. 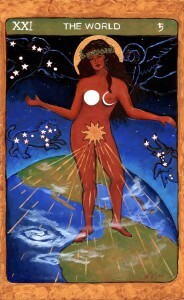 Anima Mundi stands with one foot on earth, one on water with her head in the stars surrounded by the wreath of triumph. She is a woman who might come from any continent. 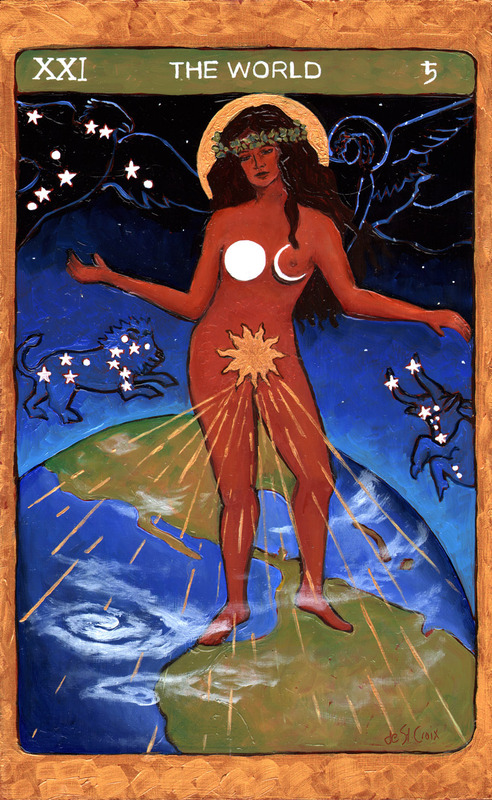 She represents the origin of life with the sun radiating from her womb and her breasts are the full and new moon. I grew up in South Africa and even though I moved to New York after I finished high school to attend art school and made the United States my home, I have never lost my love for Africa. The rich colors of the cloth, the exotic fruits, the brilliant sky and lush vegetation and the beauty of the people vividly remain with me. The Queen of Pentacles is the sensuous embodiment of abundance. The Queen of Sheba inspired this Queen of Pentacles. 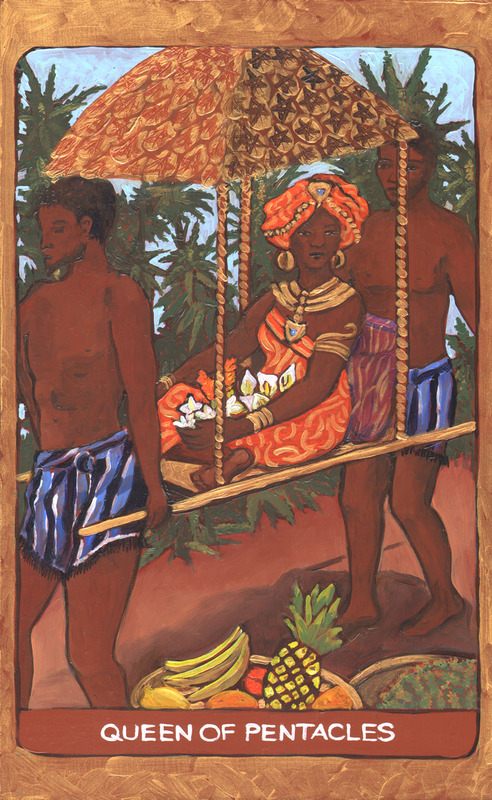 Ripe fruit, fragrant flowers and a gold palanquin represent the riches from the Earth. Her bearers are two virile young men who adore their beautiful, generous Queen. In the fields behind her grows the sacred herb of Ethiopia and its golden buds are plentifully stacked on a gold platter. 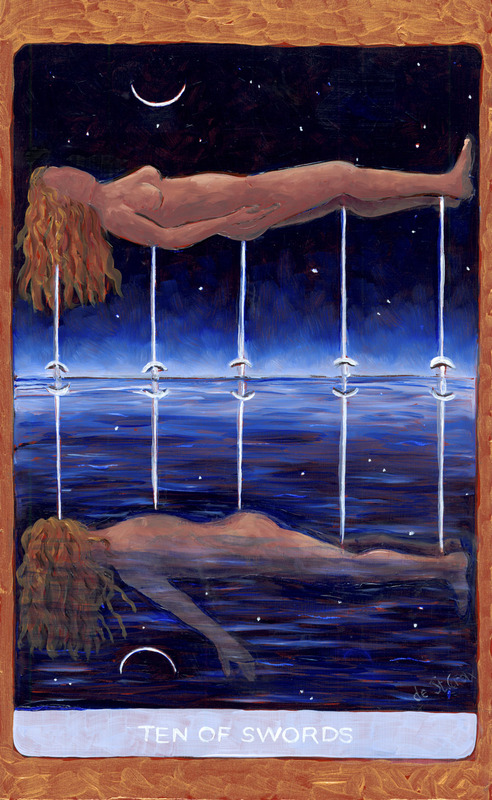 The Ten of Swords represents both the expression of self-sabotage by worries, victim hood and powerlessness as well as the promise of a transformation into a new way of seeing challenges. That what does not kill us makes us stronger. One figure floats face down, drowning in despair, but it is a distorted reflection of herself who is also able to rise above the sharp lessons. 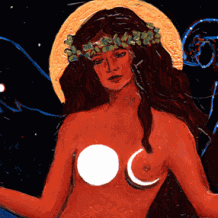 The rising figure faces a new moon promising a new beginning, while way below the sinking figure the old moon fades. Traditionally this is a pretty dismal card, it is important for me to find positive ways of depicting the meaning without losing the teachings of difficult cards. TheReviewer’s Note: Lisa has been sharing her creative journey through the Tarot with the Tarot Professionals Facebook group. With each new card that she pulls from her deck to paint next, she discusses the themes, symbolism and messages of the card with the Tarot Professionals Facebook community. It’s been interesting to see the process in action, and to be part of the creation of such a unique, vibrant and beautiful deck. I, for one, can’t wait to see it completed and released! Following the progress of Lisa’a evocative Tarot deck is a real treat! Her insights told through stories in both image and word are expressed in wonderfully original and and inspiring ways! I highly recommend following the Tarot de St. Croix. Once available, Lisa’s Tarot deck will be in high demand.